A real estate customer relationship management (CRM) tool is one that tracks buyer and seller leads throughout sales processes. We compared 19 platforms and chose the six best — including the best real estate CRM overall — based on price, tracking features, ease of use, customer service, and reporting options. For a real estate agent or office, the effort of juggling each lead, understanding their position in the pipeline, and moving them through the buying cycle often takes time away from making sales. To address this, we chose CRMs based not only on price, but on ease of use, tracking functionality, and straightforward reporting to help agents better manage their sales pipelines. Wise Agent checks all of the boxes mentioned above because it is an affordable real estate CRM with robust features like automated marketing, built-in landing pages, and lead tracking. All of these features are managed through a user-friendly dashboard, and comprehensive enough to help you stay engaged with contacts all the way through the sales cycle. Wise Agent CRM is an industry-leading real estate CRM, noted for both its comprehensive features and affordability. It provides lead tracking and pipeline management, along with marketing tools like email campaign creation. 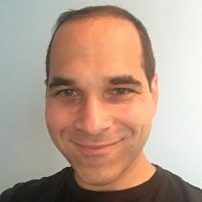 Wise Agent is particularly unique because it provides these features — as well as reporting — for a low per-user fee. Given these standout offerings, we believe Wise Agent is the best CRM solution for real estate agents who are just starting out and are likely operating on a limited budget. Wise Agent is affordably priced at $29 per user, per month with a complimentary one-on-one onboarding after a free 30-day trial period. If you choose to sign an annual contract, the price drops to $25 per user, per month. There is custom pricing available for large groups and teams under its Enterprise program. Wise Agent does a good job of packing features into a single pricing tier. These features include email marketing, a team calendar, landing pages, document storage, robust reporting, and more. Unlike other real estate CRMs like PropertyBase, Wise Agent provides all of the features real estate agents need to engage with their leads without adding layers of complexity or cost. Like PropertyBase and Realvolve, Wise Agent is designed with email templates and autoresponders that are easy to set up with an intuitive editor. Drip marketing email campaigns deployed at set intervals keep leads involved in the buying cycle, while emails triggered by user behavior — like a visitor clicking on a property within the agent’s website — can send them more information about listings or encourage them to schedule a viewing automatically. Keeping the whole real estate team on the same page is easy with the Wise Agent team calendar. You can sync calendars easily for all users in an agency and check the availability of other team members. This keeps the whole team on the same page. The Wise Agent calendar also syncs with your Google calendar. Wise Agent customizable landing pages — created using simple templates and a drag-and-drop editor — give agents the ability to create listing-specific pages which can collect lead information. Customizing these pages is easy with the image and text modules that are included. Additionally, Wise Agent includes robust lead capture forms and offers users the ability to link their own domain names to individual landing pages. Wise Agent social media contact enhancement uses the email addresses of new leads to search through social media profiles. If matching profiles are found, the CRM pulls forward information on lead relationships, location, demographic data, and more. This information can then be used for targeted ad creation and marketing campaigns. Frequently used documents, presentations, and files can be stored for quick access on the Wise Agent dashboard. All users get unlimited storage, so it’s easy to use this feature for sharing files with users and centralizing all documents needed for transactions. LionDesk similarly offers unlimited document storage. At the top of the Wise Agent dashboard are category buttons that can be used to build a report. 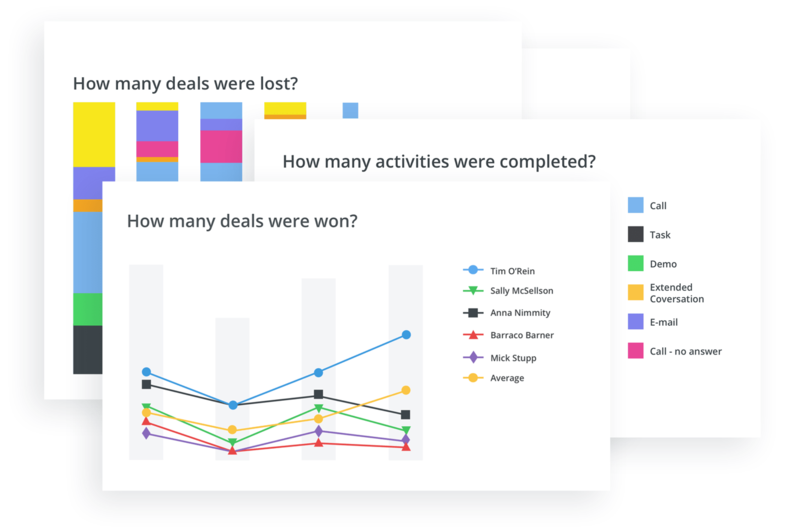 Report categories include completed activities, emails sent, leads, team efforts, and goals. Although the reporting is not as detailed as Freshsales or PropertyBase, the basic metrics help agents analyze sales and rework goals. Reporting dashboard from Wise Agent free trial. It is obvious that third-party integration was carefully incorporated into the DNA of Wise Agent. The list of tools that interface with Wise Agent includes Mailchimp, Zillow, Zapier, G Suite, Facebook, Twitter, and BombBomb — among many others. To integrate these platforms, real estate agents can click the “Integrations” tab in the top menu, and then click on the third-party options that match their needs. Although the platform can seem slightly dated with old layouts and dashboards, Wise Agent is intuitive without sacrificing features. It combines the visual nature of Pipedrive with the performance of PropertyBase to make daily use easy. You don’t have to go through several screens or different modules to get the information you want, and many actions can be completed without leaving the dashboard. The first step in using Wise Agent is a complimentary one-on-one onboarding for all accounts. In addition to this, Wise Agent offers 24/7 support with every package, which goes beyond other solutions like PropertyBase. If customer support with online videos and training are an important part of your success, then Wise Agent is a good choice. Welcome text from Wise Agent. 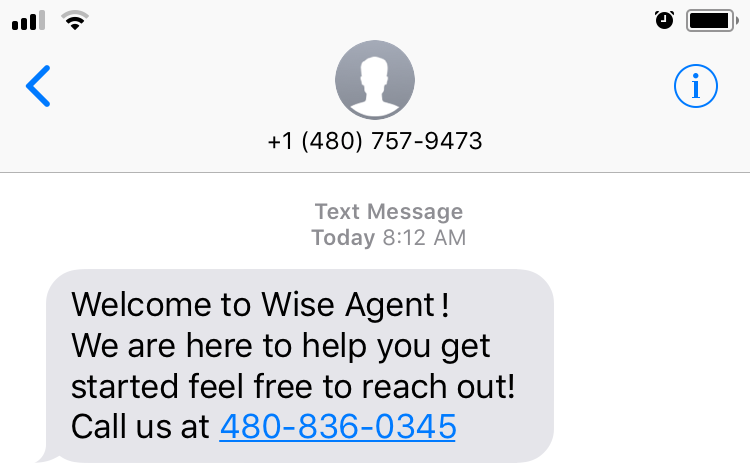 Wise Agent is missing lead generation and advertising capabilities. This is a common trait of most real estate CRMs, but it is a problem that’s solved by integrating a third-party lead generation solution like BoldLeads or Real Geeks. The majority of users felt that Wise Agent was easy to use at a great price. There were some notes indicating the interface seemed dated to users who were accustomed to sleek platforms like Pipedrive, but users also reported that Wise Agent was the best value for the money. Learn more about pricing and reviews on our Wise Agent CRM review page. Visit the Wise Agent website to find out more about its features and services. Click on “Pricing” in the top menu bar to review available packages. You can also use the 30-day free trial offer to see if Wise Agent is a good fit for your real estate office. Freshsales is an easy-to-use, low-cost CRM that isn’t specifically designed for real estate but can be suited to real estate agent needs. It’s particularly desirable for its customization options and robust reporting but also includes marketing tools and lead assignment functionality. These features make Freshsales ideal for busy real estate offices and brokerages that want more control of the look and feel of their CRM and are interested in tools for agent management. Freshsales starts off with a Free Forever basic plan and upgrades to a feature-rich real estate CRM beginning at $19 per month or $12 per month with an annual contract. This is slightly cheaper than Wise Agent or LionDesk, and it comes with a 30-day free trial. 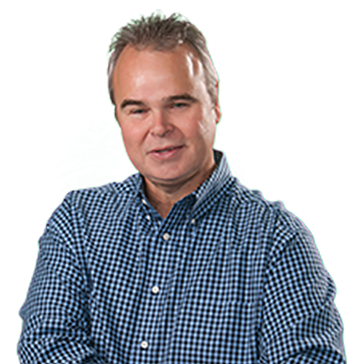 The Free Forever plan includes the basic elements of a real estate CRM, including pipeline management, deal checklists, a contact database, built-in phone, and lead tracking. You also have access to a built-in phone app. If you’re looking for a bare-bones option, the Free Forever might be all you need. However, if you want access to phone support, marketing tools, and reporting features, its Blossom or Garden plan will likely be a better fit. The Freshsales Free Forever plan is right for agents who are starting out and want to begin tracking leads. It’s the ideal way to get a feel for a CRM without complex modules to complicate tracking processed or increasing cost. Plus, you can always upgrade when it comes time to add more features. While the Free Forever plan includes the basic elements of a real estate CRM, the additional features in the Blossom tier include basic reporting, task lists, and email templates for easy setup of email marketing campaigns. The biggest missing feature is customization of the CRM to meet the agent and broker needs. The Blossom tier is right for individual agents and small offices that need the basics in a real estate CRM with email marketing functionality and reporting at an affordable price point. The added marketing features for the Blossom tier makes connecting and staying engaged with leads easier and quicker. 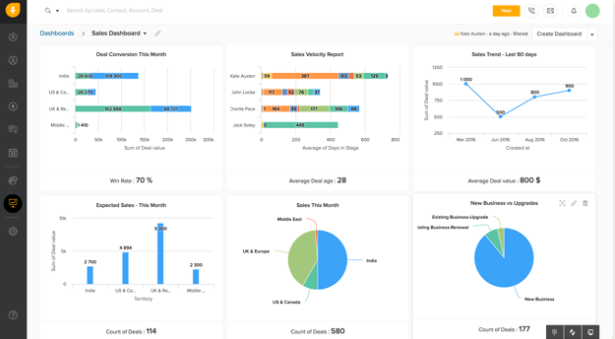 Freshsales CRM dashboard (image via website). The Garden tier is where Freshsales adds customization to help agents create the ideal real estate CRM for their needs. With the ability to configure reports and forecast sales, the Garden tier adds the most flexibility of any of the Freshsales plans. The added ability to assign leads to different agents gives users extra control over the pipeline and the workflow process, similar to Pipedrive. The Garden tier is a great option for agents or small agencies that are interested in spending more money to be able to customize their real estate CRM. From customizing lead streams to digging deeper into sales reporting and mapping key performance indicators (KPIs), this real estate CRM is packed with features that rival PropertyBase’s at a more reasonable price point. The Estate tier adds a few valuable features like social media profile enhancement, advanced reporting, and smart capture forms to pull new leads into the sales pipeline. Smart capture forms are particularly valuable in this plan; they tell brokers where a lead comes from so they can craft marketing campaigns more effectively to nurture them through the pipeline. The Estate tier is right for brokers that want the ability to track contacts through the pipeline with enhanced reporting and lead capture opportunities. This type of data can also be useful for administrators who need an easy way to monitor the ROI on advertising investments. Pipedrive rises to the top of our list with reporting features, but Freshsales allows for more customization of reporting. Freshsales reporting dashboard (image via website). Freshsales does not have the real estate design of other realty-specific CRMs like LionDesk, Wise Agent, or PropertyBase, but the same features are available. If you’re keen on finding a real estate-specific CRM, then you might want to try one of the other options on this list because Freshsales customization might be time-consuming. Most users expressed a positive experience with Freshsales, noting, however, that it required some upfront investment in customization. Other users noted that the quick learning curve and ability to hit the ground running were advantages of Freshsales due to its ease of use. Visit our Freshsales CRM review page to find out more. With the basic CRM features rolled into the Free Forever plan and a 30-day free trial, you can try Freshsales out for an extended period of time to find out if it is right for you. Visit Freshsales website today to find out more. 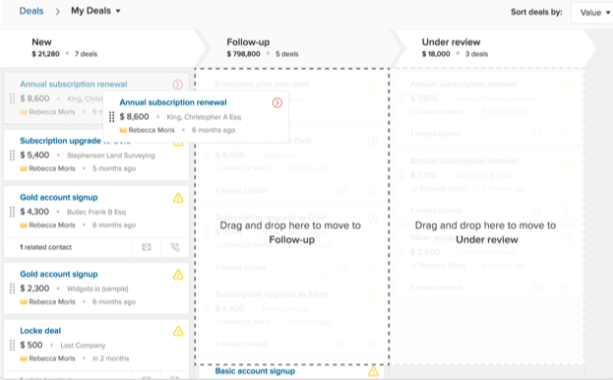 Pipedrive is a full-featured real estate CRM starting at $15 per user with a visual overview of the entire sales pipeline that can be manipulated easily with drag-and-drop functionality. Pipedrive is perfect for “visual learners” — real estate agents who like a visual dashboard to quickly see where each lead is in the pipeline and drag-and-drop leads to new lead stages for easy management. Pipedrive begins with the basic features of a real estate CRM at $15 per month, which is affordable compared to other solutions like PropertyBase. Each package becomes more attractive with an annual contract that saves the agent about 17% per month. With a 14-day free trial, you can test the features without risk easily. At the Silver tier subscription level, Pipedrive allows customization of the dashboard mixed with a streamlined pipeline view that gives real estate agents a clear and accurate picture of their sales opportunities. 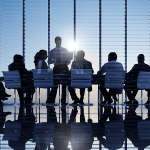 The Silver Tier also includes advanced reporting that includes the number of opportunities currently available, sales performance, and how many deals were won and lost. The Silver tier package is perfect for individual real estate agents who want the power of reporting mixed with the basics of an easy-to-understand dashboard that allows you to take action and complete tasks quickly. With the ability to create calendar events and set follow-up reminders from one place, agents get an easy-to-manage real estate CRM at an affordable cost. Pipedrive advanced report features (image via website). The Gold tier is all about taking a step up from the daily sales process to build in marketing automation and allow buyers to schedule their own meetings with you through online forms. Gold Tier marketing tools include user-triggered emails and text messages as well as drip email campaigns and autoresponders. The Gold tier is right for busy real estate agents who want to customize their marketing efforts and get rid of repetitive tasks that eat up time. With automated emails and follow-ups combined with the ability for buyers to schedule their own meetings, you are free to move on to closing more sales. The Platinum tier allows administrators to create team tasks and reports to measure performance against goals. The forecast feature gives you the ability to see revenue predictions based on marketing and advertising efforts. Additional features like customized permissions and single sign-on give administrators the power to analyze the way a company works, from lead capture to completed sale. The Platinum tier is right for agencies and brokerages that need the ability to track leads, while also managing the performance of individual agents, teams, and the company as a whole. It can be used easily by both individual agents within a company and by administrators who need to create robust sales reports and forecasts. Features of Pipedrive, image via Pipedrive website. Pipedrive is a lead tracking system. Real estate-specific marketing templates, drip campaigns designed for real estate agents, and lead generation tools are missing. For those seeking a CRM that is designed for the real estate industry, you might want to try Realvolve, Wise Agent, or LionDesk. Most users are happy with the way that Pipedrive presents information in a clear, visual way that cuts down on searching through menus or looking for ways to complete tasks. Some Pipedrive users were dissatisfied with the lack of scalability, such as the ease of upgrading from one plan to another. So, if this is an issue, then you might want to try a team-based solution like PropertyBase. Visit our Pipedrive review page to find out more about what users think. Visit Pipedrive online and click on “Pricing” in the footer to learn more about available plans. You can also try out Pipedrive with its 14-day free trial and test all of the features for yourself. Visit Pipedrive today to sign up or find out more. LionDesk is a real estate CRM with advanced marketing technology like video emails and texts. Additional innovative marketing tools that set it apart include social media lookup of new leads, click-to-call functionality, and text-to-sell codes, which allow you to connect with leads easily. The LionDesk CRM starts at $25 per user and is best for agents and realty offices comfortable with technology and interested in marketing via their CRM. LionDesk offers a free 30-day trial to test features. Thereafter, pricing starts at $25 per user, per month for the Pro Plan and moves up to $49 per user, per month for the Pro Plus plan, which includes additional features. Custom pricing is available for larger teams at the Enterprise plan level. Many real estate CRMs include contact databases, pipeline management, email drip campaigns, and auto-responders. LionDesk adds to these baseline features by including dynamic video emails, video texts, and click-to-call features. Real estate agents can customize their LionDesk email and social marketing campaigns to share information with a buyer, like new property listings, based on buyer preferences and search habits. Unlike any other CRM on the list, LionDesk allows videos to be added to email templates to personalize the buyer experience with messages from the agent or walkthroughs of a property. Users can also use LionDesk to create specialized codes and phone numbers that can be used for specific email and text message campaigns. This allows agents to track lead communication more easily. Also, LionDesk can create local area code phone numbers for agents so that they can keep their own phone number private. LionDesk has a friendly team and individual calendars that allow agents to set reminders for follow-ups. This feature is available with Wise Agent at about the same price point but is more complex in LionDesk. If technology is a pressure point for your real estate organization, Wise Agent is probably a better option. Despite the incredible features of LionDesk, internet data exchange (IDX)-enabled landing pages are not included in the CRM. If you already have a website and you want to add enhanced marketing features, then LionDesk is a good choice. For agents that want a one-stop approach to their real estate business that includes an IDX website or landing pages, then PropertyBase or Wise Agent are better choices. Using lead email addresses, LionDesk can search social profiles in LinkedIn and Facebook to find more information about a lead. This information is then added to the lead contact card in LionDesk CRM to help real estate agents with their marketing efforts. If you want a less technologically complex real estate CRM, then Wise Agent or Realvolve would be better. Agents can keep materials in LionDesk’s document storage for easy, continuous access. Similar to Wise Agent, LionDesk CRM provides 200MB to 1GB of storage, depending on your plan. This storage is ideal for holding videos for emails, images of properties, or various other multimedia that you plan to use in marketing campaigns. LionDesk has a robust reporting structure for daily use and long-term forecasting. With reporting that mirrors Pipedrive, Freshsales, and PropertyBase, LionDesk boasts an easy-to-understand and customized reporting dashboard that shows sales by contact channel, leads by source, expected sales, pipeline stage, activity log, and email metrics. If sales reporting is important to your office, then LionDesk is a good real estate CRM option for you. By integrating well-known real estate and standard third-party solutions like Facebook ads, Zapier, Real Geeks, Zillow, Trulia, and Realtor.com, LionDesk is expanding the big sales picture by capturing all leads from multiple lead generation sources in one place. LionDesk, like Zillow Concierge, also contacts each new lead with a customized auto-responder to ensure they remain engaged. LionDesk is very easy to use with an intuitive visual display that balances tasks with reporting features and a to-do list that doesn’t get in the way of usability. Similar to Wise Agent, the LionDesk dashboard feels sleek and modern with a design similar to popular email or web browsing platforms. Like Pipedrive, it’s easy to click around in LionDesk and figure out actions without the need for instruction. Similar to Realvolve and Wise Agent, LionDesk offers email and phone support five days a week from 7 a.m.-5 p.m. Pacific time. Inside the dashboard, there is a chat module for asking questions and all accounts start with a free onboarding call to help real estate agents make the most of their CRM. 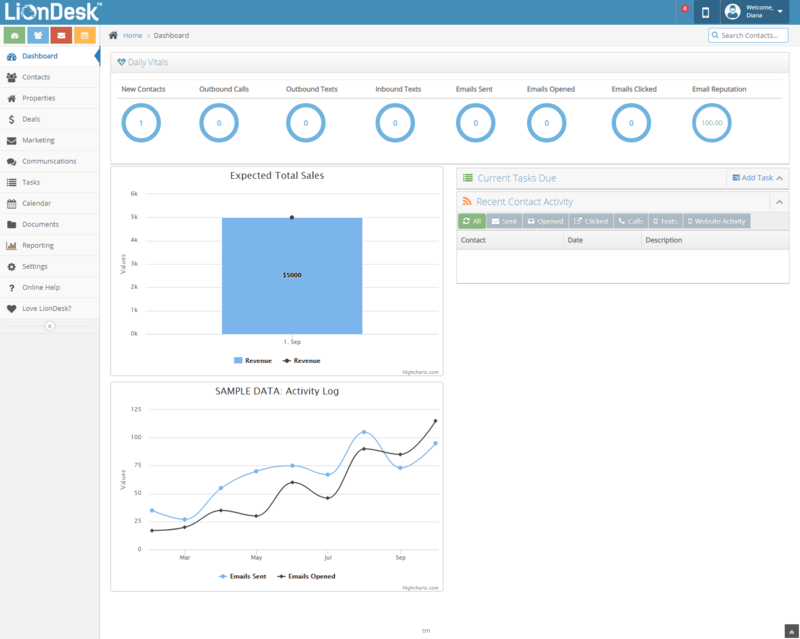 LionDesk dashboard available with a free trial. LionDesk CRM is missing out-of-the-box usability. The LionDesk interface feels more like Realvolve or Wise Agent with some lifting for customization, but the customer service is available to help get you started. If quick setup is an issue, then you might want to examine other options like Pipedrive. Reviewers agree that the setup of LionDesk requires a time investment, but most also agreed that it was well worth the effort for the features to be of full benefit. Similar to advocates of Wise Agent, users thought that LionDesk was an exceptional real estate CRM for the price point. Check out some LionDesk reviews for more information. Visit LionDesk’s website to find out more about its robust real estate CRM. Click on “Pricing” in the top menu for full plan information. You can test out LionDesk with its free 30-day trial and get a feel for all of the features. 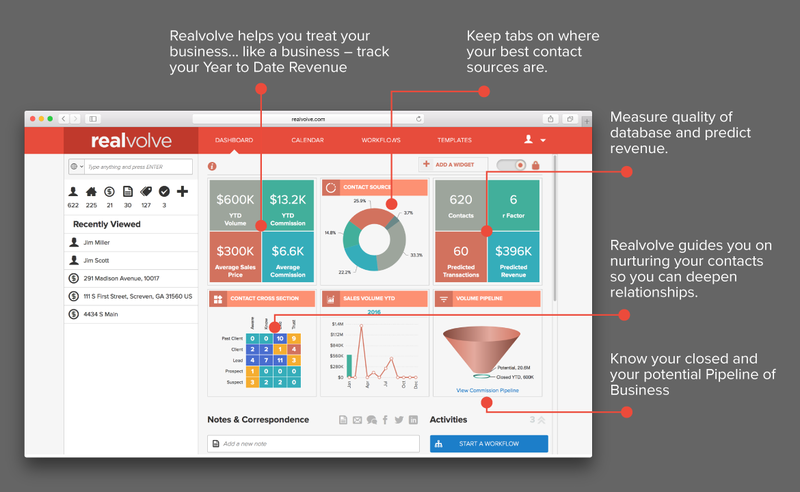 Realvolve uses the basic building blocks of a useful CRM to create a low-maintenance and robust lead tracking system, starting at $59 per month. Without complex modules to learn, agents avoid extra clicks, track leads with ease, and stay engaged with buyers. 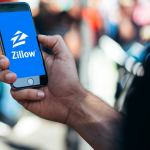 Real estate agents can increase efforts to stay connected with buyers without juggling other tools, making it far and away the best option for nontech-savvy agents. Realvolve’s pricing is based on the number of users. Slightly more expensive than Wise Agent and LionDesk, Realvolve begins at $59 per month for a single user and one assistant. The price break for an annual contract reduces the cost, however, and a 14-day free trial gives you time to learn about the features. Realvolve takes its real estate CRM back to the basics to create an easier platform that saves time in task completion. It offers advanced features like email, social media lookup, and texting in an easy-to-use interface. 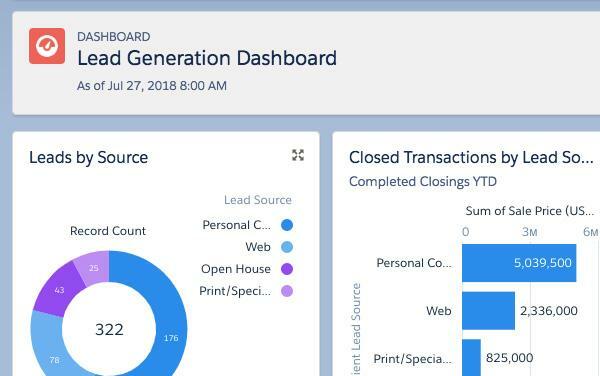 Realvolve is the best real estate CRM for agents that want the ability to connect with leads and track their progress through the sales channel without complex modules or various steps. Realvolve ensures you can communicate with leads multiple ways, including via automated emails and auto-responders as well as text messages so that you can reach contacts at different touchpoints and send timely follow-ups. Agents can customize Realvolve email templates to set up and send communications to targeted groups of buyers quickly. 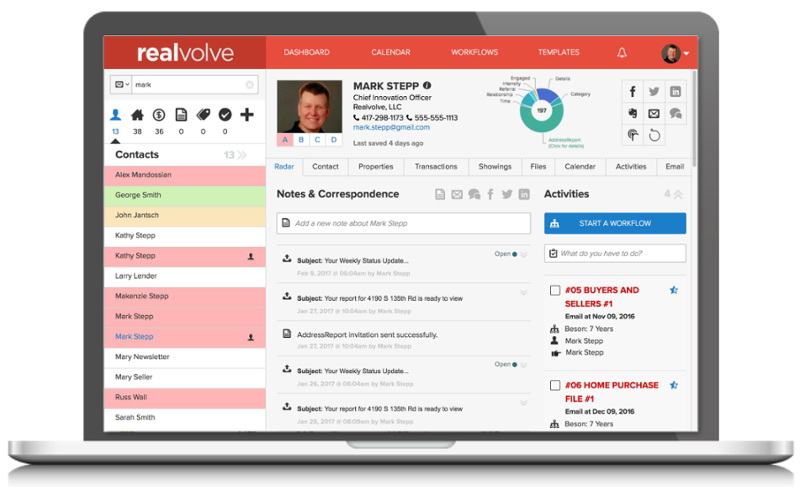 Realvolve allows you to manage deadlines and key dates with a calendar synced between devices where you can view tasks and due dates for a single contact or property. You can also customize the calendar to create workflows and processes to keep your team organized. Realvolve has integrations to support landing page creation and design. Its integrations include LeadPages and Easy Agent Pro. If you want a CRM that has built-in landing page creation and customization, Wise Agent might be a better fit. Realvolve has Facebook and Twitter integrations available so you can automate your posting or social media advertising efforts. You can send social media messages directly from the Realvolve, similar to Wise Agents’ dashboard. Realvolve has unlimited storage for documents and presentations. This amount of storage is typically only available for higher-priced plans, as is the case with PropertyBase. This makes Realvolve great for agents who need to centralize all of their multimedia marketing materials. Realvolve matches other real estate CRMs like Wise Agent for sales reporting functionality. True to its time-saving mission, Realvolve uses widgets to display sales reports on the dashboard at sign in and allows for only basic reporting, including average commissions, revenue, sales volume, and the number of closed deals. If customized reporting is important, then Pipedrive or Freshsales are better choices. Sales reporting via Realvolve website. Realvolve integrates with well-known platforms like G Suite, Zapier, various email programs, and Evernote as well as social media platforms like Twitter. These integrations allow real estate agents to interact on social media and via note-taking apps seamlessly. Realvolve focuses on making its real estate CRM intuitive and functional. Designed to mirror website browsers and email interfaces, Realvolve delivers what users expect to see without unnecessary complications or clunky modules. The easy-to-read dashboard captures the whole picture at a glance like Pipedrive or Freshsales. Realvolve goes the extra mile in customer support. With efforts that match Wise Agent and LionDesk, Realvolve checks the customer service box with phone, email, and chat support alongside online videos and podcasts to help you make the most of the CRM’s features. Like LionDesk and Wise Agent, the look and feel of Realvolve can be basic for a sophisticated user expecting a more visual appeal. However, the lack of complex modules lowers the learning curve for many users who want to finish the job. Most users think that Realvolve delivers on the promise to provide a basic real estate CRM without extra fuss or added menus. Some users noted that there was some setup time involved for customization, but it was worth the effort. Find out more by reading our Realvolve CRM reviews. Visit the Realvolve website, then click “Sign Up Now” for your free 14-day trial and see if it is right for your real estate office. You can evaluate the features and ask questions through its website. PropertyBase CRM is a real estate-specific CRM starting at $79 per user, complete with IDX-integration, robust sales reporting, and transaction recording. Its standout feature, however, is its integration with Salesforce. Due to this advanced functionality, PropertyBase is best for users who already use Salesforce to manage leads and need to combine it with a real estate-specific CRM for marketing and additional pipeline tracking. PropertyBase is a higher-priced real estate CRM for larger, Salesforce-familiar teams that starts at $79 per user, per month. Unlike other CRMs, all packages are billed yearly, and there is a minimum of four users, so making good use of the 14-day free trial to examine features is very important. The biggest difference between the Small Team tier and the Company tier is the minimum seats required for participation. With the same features, including drip email campaigns, document management, website, sales tracking, lead management, and transaction recording, it really comes down to price. If you have a team of three people and pay the user fee annually for the Small Team tier, then the cost is $3,564 yearly as opposed to the Company tier for four users costing $3,792 per year. For teams that are using Salesforce as a base and want this turnkey real estate CRM solution, the PropertyBase Small Team and Company tiers are worthy of review. PropertyBase Enterprise offers commission portals for agents, franchise management modules to make licensing run smoothly, unlimited media storage for ease of asset access, and a deeper financial picture via sales reporting and forecasting. The Enterprise plan takes companies into a fully developed sales and lead-tracking real estate CRM with an emphasis on business management modules. Larger real estate agencies or realty offices with a franchise investment to monitor will appreciate the extra features included in the Enterprise tier of PropertyBase. This extra business tracking functionality offers a complete picture of company successes and failures. Propertybase Lead Generation Dashboard (image via website). PropertyBase offers customer support through trouble tickets and an online library referred to as Self-Support. Unlike Wise Agent or LionDesk, representatives can take up to 48 hours to respond. Given the complexity of the system, if customer support is an issue for you or your team, then you might want to look for another option. PropertyBase is priced above other more user-friendly options like Wise Agent due to the minimum user restriction. The PropertyBase CRM might include teams as small as three people, but individual agents will find this a costly option when compared to LionDesk CRM, Pipedrive, or Freshsales. Some users noted dissatisfaction with the learning curve associated with the various modules in PropertyBase and slow customer support. Other users expressed their happiness with the features and all-inclusive nature of the platform of PropertyBase. Find out more on our PropertyBase CRM review page. Check out PropertyBase’s website to see how its CRM might work for your realty office. Click on “Request Demo” in the header menu for a look at all of the features. There is also a 14-day free trial available to new users who want to see if PropertyBase is right for their team. Picking the best real estate CRM means making sure that leads are easy to track through the system and that the CRM itself is intuitive for the agent. If a task takes too much time to manage or the dashboard is hard to read, then it’s likely to complicate sales processes, not streamline them. For that reason, be sure to consider usability, feature complexity, mobile-friendliness, and cost. The best real estate CRM for your office or brokerage depends on your budget, technical skill level, customization need, and a minimum number of users. Although we tried to find the best six to meet the needs of real estate agents with teams of all sizes and experience levels, it’s possible you need an alternative. A real estate CRM is critical to tracking leads through the sales process. A good CRM helps agents stay connected to potential buyers until they are ready to purchase a property without vastly increasing time investment. These criteria helped to qualify the six top real estate CRM suggestions on our list for users of all experience levels. Wise Agent emerged as the best real estate CRM because it is packed with the easy-to-use features that agents need to take their sales to the next level without eating up profits. With a 30-day free trial and outstanding customer service and integration, you can try out Wise Agent for your office without risk. Thank you so much for helping me navigate the sea of CRM options out there with a more simple, to the point approach. Hi May – Glad it was helpful. people interested about everything’ve got to say. Just my opinion, it could bring your blog a little livelier. I am currently using realvolve and I love a lot of the features it has to offer. However, my only complaint is that they do not offer IDX but it’s only for your listings. No property searches for buyers like some of the products reviewed. Any chance you could review Real Geeks & Commissions inc? I’ve heard good things about Realvolve, but if we reviewed every CRM this article would be even longer… It’s 4,000 words already! That said, we do plan more in-depth reviews of other CRM platforms in the future. If you’re interested in Real Geeks, we reviewed them in a buyer’s guide on lead generation websites here. We also have a reviews page set up for Realvolve here if you’d like to leave a review. Hi Loren, we have an update currently in progress. Check back soon! I have been researching CRM’s for the last 45 days. I signed up for free trials on the 3 I found to have the most features I was looking for…Wise agent, Liondesk and Ixact contact (all in the $27-35 monthly range). While all 3 had great features and user friendly interface I found Ixact to have the most features for the price ($33month). It’s a comprehensive CRM, but also includes automated lead importing, drip campaigns, mass emailing, 2,500 per month included, monthly newsletter, email marketing templates, mobile app, included basic agent website with optional idx ($33 extra monthly) and more I can’t remember. The only thing missing was a texting feature, the system sends new lead texts alerts but you can’t text clients from the program. Otherwise, for me its hands down the best value for what I needed. Great info here! We need to do an article ranking these three as well. Stay tuned. Coming in the next few weeks. Using a CRM is a great addition to your business. I currently use Podio and it has helped me keep everything nice and organized. I always thought that Podio was more of a project management tool? In any case, the best CRM is the one that you use consistently. Good luck.